Every so often I hear of something so screamingly obvious that I can’t believe a) I’ve never thought about it before and b) that it didn’t already exist. Today I have heard of just such a thing. Supporting Sisters is a new charity that collects and distributes sanitary products and underwear to homeless women via the Colchester Night Shelter. Supporting Sisters believe that all women deserve to be comfortable when their time of the month comes, whoever and wherever they are. They accept donations of brand new underwear and sanitary products. They are able to accept individual products as long as they are individually wrapped. For further details of how to donate please keep an eye on their facebook page where they will also advertise events in order to raise money and awareness. Seeing this made me wonder how many other towns are running similar schemes, if you know of any local to you please add the details in comments. Here is a recent Telegraph article about #TheHomelessPeriod. Fantastic local activism. 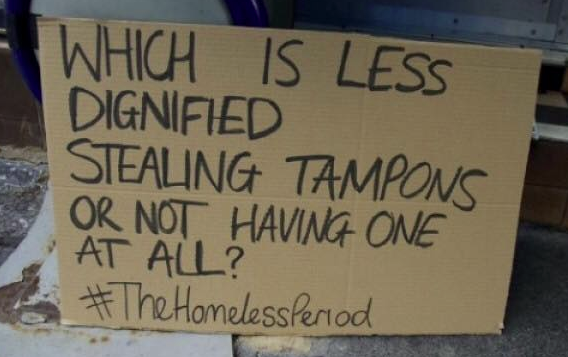 You’re right – I’m ashamed to say I hadn’t thought how difficult it must be for homeless women. It’s bad enough for the rest of us. Spread the word, ladies and gents. I’m a local, also homeless and not heard of this, Beacon house I think also offers this service, thanks for highlighting. Are YOU Driving A Killer Car? I Am.